One way to a person’s heart is through one’s stomach. For people like me who can’t cook to save my life, this would require a little outside help. Well, all of outside help. While cooking requires time and effort, looking for the best food in town can be a drag too. Nothing makes you hungrier than having to scour through dozens of Internet opinions and pictures of scrumptious food on whether a restaurant has anything good to offer. On the other hand, while you’re looking for a decent place to eat, you don’t crave for particular restaurants, you crave for the food. 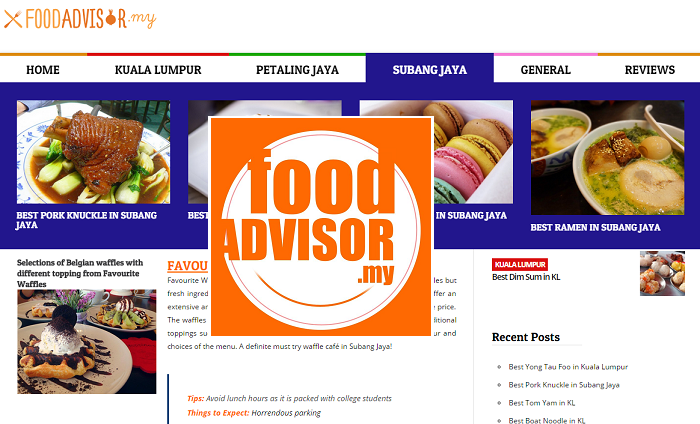 Foodadvisor.my understands this and has a compilation of the best place to satiate your craving in Malaysia, covering areas such as Subang Jaya, Kuala Lumpur, and Petaling Jaya. While the website is fairly new, the team has the right idea in mind with their focus on the food instead of the restaurants. We talked to founder of Foodadvisor.my, Ken on the idea behind what he calls, “The food of TripAdvisor”. When asked about how they got the inspiration to form the site, Ken said, “It started when my friend told me about him not being able to find a good place to eat in Penang. It’s not easy to find a good place to eat on-the-go. My friend and I thought that since the demand is obviously there, why not start one of our own? And here we are,” he said. “The site itself was formed on the first night,” he shared, “but it was just in the form of listings.” It managed to get a substantial amount of interest, obtaining hundreds of unique visitor views on the first month itself. Fueled by this positive interest, the team set out to improve the site. These additional information is what differentiates Foodadvisor.my from other Foodie sites and these are especially helpful so that the patrons know exactly what to expect once they set foot in the restaurant, be it pleasant servers, exceptional WiFi speed or peak hours to avoid. The “Best with (Recommended)” sections gets patrons to try out some of the other food or drink that shouldn’t be missed. “With Foodadvisor.my, we try our best at getting first-hand accounts on the experience so that the reviews are authentic and personal,” he said, “on the other hand, we are limited by lack of time and resources.” That means that while he and his team try to go to each restaurant individually to gather information, sometimes they are limited to gathering information via what is readily available on the Internet. In time, Ken and his team hopes to be able to provide reviews from actual experiences via their writers. Foodadvisor.my provides a list of of the best places to satiate your craving for a particular food, be it boat noodles, tom yam, french toast, or even tiramisu. For each food item, there is a list of places for you to choose from, so whether you’re looking for a cozy or a modern dining experience, you’ll know before you set foot into the restaurants. It also warns you of the price range, providing you with an estimate of how much you’re going to spend for your meal. When questioned on how he’s getting his website known and whether he would be able to compete with other Foodie sites, Ken agreed that it is the details and additional information that Foodadvisor.my is able to offer that makes them unique. Other than listicles of food, Foodadvisor.my also offers in-depth reviews of restaurants and cafes, not only describing the food available but also the interior and design of the place. 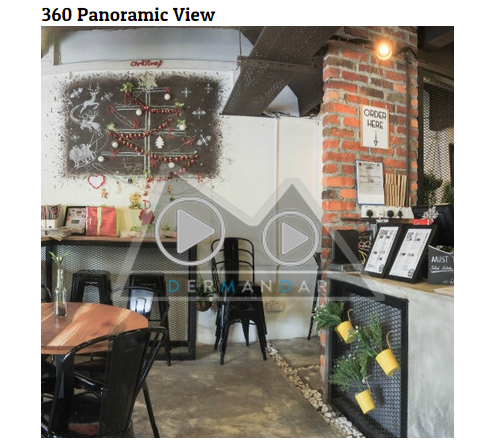 What’s also helpful is that in each review, a panoramic view of the restaurant is provided so that readers are able to visualise the setting of the place. Also, each review is accompanied by a short clip with an interview with the founders of the venue to pick their brain on the concept and idea of their business. 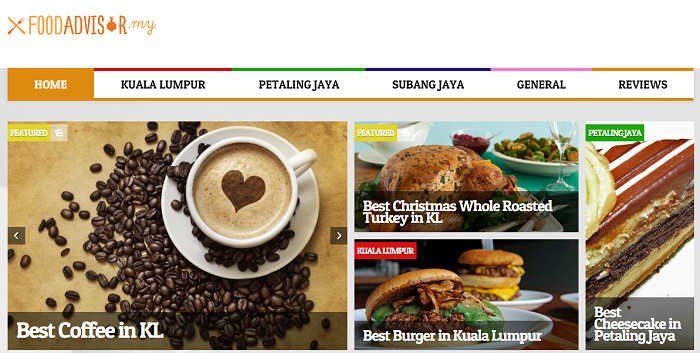 Currently Foodadvisor.my is focused on Kuala Lumpur, Petaling Jaya and Subang Jaya only, with plans to expand to more areas in the future. Ken insists that they would not be releasing an app anytime soon, however, since they want to focus on improving the site first. With the completeness of the information that it is able to provide for its users, I think that Foodadvisor.my is definitely on the right track. Ken shared that they are consistently producing one or two new listicles a day. There are currently more than 90 articles on the site, so there are more than enough choices to pick from! If you’re unsure of where to have your next meal, check out their site and Facebook page, I’m sure you’ll find something you like. Meanwhile if you feel like you’re up for a challenge, you just might want to check out their list of best food challenges. Go on, I dare you.